One of three interviews I did at the 2019 Los Angeles Festival of Books. It was a terrific day! 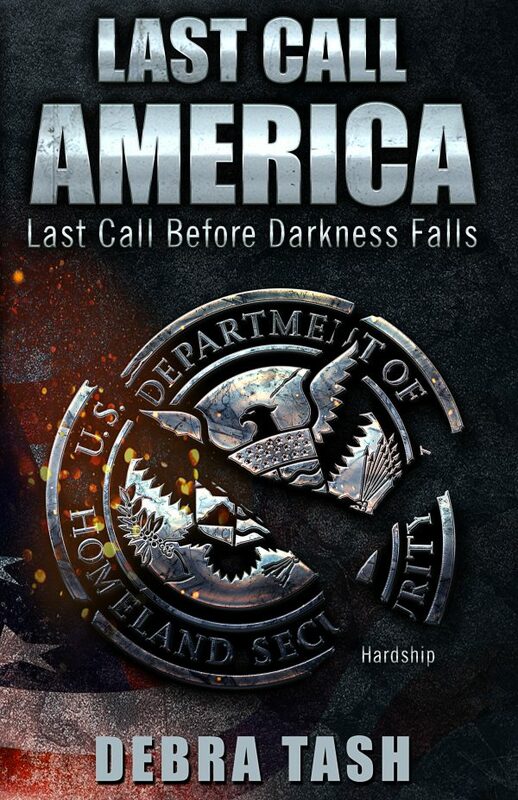 In her latest book, “Last Call America” Ms. Tash gives us a realistic look at what could happen in our own United States. Through the eyes of a young lady caught up in the horror of martial law and a government out of control we watch her fall in love. We move with her and her young man as they answer the call to save our Republic. As their fellow citizens lose all food and livestock to government raiders we become involved in the fast moving action and cheer our heroine and hero as they face pressures almost beyond endurance. We hear the explosions from military armaments and shudder at their devastation. And, thanks to Ms. Tash’s extensive research we learn the function of multiple new age weapons. A must read for anyone who enjoys love’s endurance throughout the strain of heroic effort. A must read for anyone watching our Bill of Rights disappear and is concerned this might happen to us. “Last Call America” is a very real wake up call. A notice that all of us must become active in our Country’s future. Debra Tash is an award-winning American author, journalist and accomplished speaker. Her books have won multiple awards and been sold nationwide. Debra was born in Los Angeles where she honed her writing skills through various creative outlets including painting, with a few of her pieces touring internationally in Japan. She gets her inspiration from current and past events, Debra Tash focusing on positive morals and uplifting themes. Her most recent book “Last Call America” focuses on the not so distant future and takes the current American political climate to a chilling collision. Vertikal spent a delightful time with Debra Tash interviewing her on a Taste Of Ink Live. Enjoy! What is your writing Kryptonite? DT: It’s what is interesting to me. I have written on ancient history, on events during the founding of our nation and now my latest, set in the not so distant future. It’s seeing all of human history, the elevated perspective, that nothing is new under the sun. We make the same mistakes. This gives me that Kryptonite, the key inspiration to write, at times light heartedly, at others with a sharp edge. What literary pilgrimages have you gone on? DT: I’ve traveled to Europe, mostly Italy, marveled at what others have left behind, monuments, ideas, hopes. The travel that affected me the most is visiting the battlefields of our own American Revolution. To see the Valley Forge encampment and know that with the harsh conditions they endured, the lack of pay and support, the army should have deserted. But what the enlisted were there for was larger than their leadership, the Congress, their generals. They were there for their individual freedom which so much larger than who is in command or who is in power. Every one of them had their own dream, and they wanted to win it. That was very inspiring. Do you want each book to stand on its own, or are you trying to build a body of work with connections between each book? DT: This book will stand on its own. I do have it in three parts but decided to release it as a whole. I have a body of work but it is work that I wanted to do, was inspired to do, that was entertained doing it. That is my body of work. If you could tell your younger writing self-anything, what would it be? DT: Get your work out sooner. Don’t be afraid of rejection, criticism, be bold. Don’t look for affirmation out there. Know you’ve done the best you could and say it. How did publishing your first book change your process of writing? DT: I have been published by smaller houses, micro-publishers. I learned that I can’t write for the market because by the time I finished the market changed. I just knew I had to go on and perfect my craft. What was an early experience where you learned that language had power? DT: Language does have power. These days, with information overload and sound bites, crafting that bite that will stick with people. That phrase they can take with them is much more powerful than a million words of prose. Learning to write that phrase, that memorable character, that use of spoken and written language that stays with your listener/reader is real power. How many unpublished and half-finished books do you have? DT: More than I can even remember. When I shuffle off to Buffalo I have to leave a note in my closet, “Enter at your own risk.” You have to learn when to walk away from a project. What does literary success look like to you? DT: To have someone say/write that the book/article that I wrote stuck with them beyond the moment that they were entertained. That is the real success. Do you read your book reviews? How do you deal with bad or good Ones? DT: I do. It sometimes means something and is helpful. What isn’t is the ones where they just knock your work, come out of the blue and for leaving me asking, did they even read it? This is for the good or the bad. If it’s relevant I pay attention. What did you edit out of this book? DT: So much in this one. I have a critique group and there was one person in it who absolutely despised one of my main characters. I first envisioned that character as a foil for the key protagonist. With my critique partner’s input the character developed, the arch evolved until he became a hero. Writing is a journey for both the author and the writer. The book will be available in Spring 2018 at your favorite bookseller. Homeland Security takes the place of democracy and representative government. Citizens are herded into the cities to work in factories. Those who actively resist are arrested and ultimately liquidated. Others who prefer the country lifestyle are starved to death by a central government which controls virtually every aspect of people’s lives. If Last Call America sounds a lot like Aldous Huxley’s Brave New World or George Orwell’s 1984, there is good reason. All of these books belong in the genre of “dystopia.” While this world of a pessimistic, repressive, government with no regard to the plight of the people sounds more like a case for Doctor Phil to solve, it poses a real threat to our society today. Stifling the first amendment, diluting religious Freedom, limiting job choice, unlawful taxation, disintegration of the family, and losing one’s identity are all issues to be reckoned with. Tash takes these important aspects of today’s America and places them in a society where a modern version of Big Brother controls all. Naturally, there is major resistance to dystopian America. The heroine of Last Call America is Rebecca Sanders, a second generation opponent to the forces of evil. Things change for her when Jason Poole, a dashing army officer, walks into the diner she runs with her sister Tina in rural Massachusetts. Poole at first just wants a cup of coffee. This leads to a desire for outlawed black-market fresh eggs that come from a hidden coup on the property. In time Rebecca and Captain Poole become lovers and join the resistance which resides on the other side of the border in Vermont. It is not a coincidence that the story unfolds in the same region where the Revolutionary War in the 1700’s took place. Tash does a clever job of associating what went on then to the happenings of today. In a sense Last Call America has a large helping of historical fiction in its plot lines. Tash’s earlier novel, Challenge the Wind takes place during the revolutionary war in Pennsylvania. In a way Last Call America is what happens if the British had won and continued to repress the population. The character of Rebecca Sanders is a strong women whose sense of purpose is not diminished by defeats on the battlefield as Homeland Security tries to quell the rebellion. To do so new weaponry is utilized called the “Charon” It is an electronic field that kills or maims everyone it touches much like a bolt of lightning. The only way it can be detoured is if shields are put in place to block its deadly force. Gun enthusiasts should not be disappointed because these death rays are supplemented with conventional arms that the totalitarian government was not able to seize. Much of the second half of the book is taken up by the battle between the good guys and the fascist Homeland Security forces. Ultimately Rebecca or “Honey Beck”, as the charming Texan Poole calls her, is able to triumph. As the book unfolds it is impossible to not see the resemblance with fictional character Dagny Taggart from Ayn Rand’s Atlas Shrugged. Rest assured our heroine is not destined to ride a train to Colorado to meet up with Hank Reardon or John Galt. Stand up for your beliefs no matter what anyone else says even if they lead to scary ramifications. One must always carry on because if you do nothing, all is lost. Weapons of mass destruction not only have collateral damage for the populace, but also adversely affects those who use and create them. Last call America is a page turner. Although parts of it are disturbing, (I had bad dreams one night) the pay-off is a thought provoking book which is well worth spending the time to read. Richard Eber studied journalism at the University of Oregon. He writes about politics, culture, education restaurants, and was former city and sports editor of UCSB Daily. Richard is president of Amerasa Rapid Transit, a specialized freight forwarder. Copyright © Debra Tash. All rights reserved.